From idea to electronic circuit board we can help you with the development and also with the corresponding software side of your electronics project, the connection between your specific applications and the internet, remote control, etc. …, the production of your printed circuit boards and also the certification . Almost any electronic circuit board has one or more microcontrollers. They can sometimes be very small and count even few pins. Peternet Electronics develops custom firmware for microcontrollers. We can do this in different programming languages such as assembly language, C and C ++, … and also with or without and operating system. Just like any electronic circuit board has one or more microcontrollers with the required firmware, a modern electronic design will probably need an interface with a device such as a computer, tablet, smartphone or other devices. 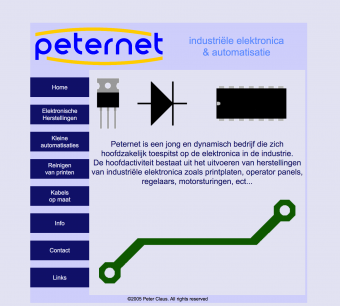 Peternet Electronics develops custom electronics-related software for PC or smartphone. This can be used for different operating systems like MacOS, Linux and Windows and in different languages like C #, C ++, Java. We can come to your company and assist your electronics design department in word and deed with electronic circuit board design, firmware and software development. We can also work with your mechanical engineers to create electronic circuit boards with even complex shapes that fit into the housing. If you need a complex controller, but you only need one or a few copies, you can often use a PLC (Programmable Logic Controller) in this case. Let us mount a control cabinet with the PLC and all the required peripheral components for your controlling application. We have good experience with Beckhoff PLCs and TwinCAT, and we can even connect them to our developed electronic signs so you can use a mix. There are many machines that work very well, but that depend on electronic circuit boards that are no longer available. Whether you have older designs from which you no longer have the design data, at most only a few drawings or PDFs where you can not generate production data. This can happen in cases where a supplier no longer exists. For several reasons, the PCB is still likely to continue to use it in your product. Sometimes it may be helpful to invest the time to analyze and rediscover based on existing charts and possibly some drawings or PDF files. Many boards are suitable for reverse engineering. In addition to reverse engineering, we can in most cases also upgrade the PCB (PCB) so that it has the same functionality, but with state of the art technology inside and made up of more readily available electronic components, because older PCBs are subject to obsolete components. The same goes for software as it may still work on an old operating system that is no longer compatible with modern hardware and therefore you can not create a new system with this software. We can also assist you in this. You can also have an old device that nobody still knows how it communicates with other systems. We can listen and analyze communication data to discover how it communicates and create a device that does exactly the same or other things with the data.